Gary Mackay-Steven believes he has improved as a player during his first year at Celtic. The winger had long spells out of the starting line-up earlier this season but has netted four goals in his last six games after winning back his place. And the 25-year-old believes his run is partly down to the training regime at Lennoxtown under Ronny Deila. 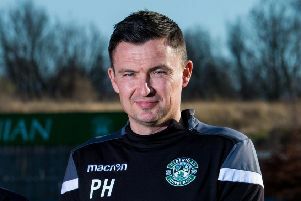 The former Dundee United player, who joined the Hoops in February last year, said: “The training is at a high tempo here so you become really fit. The manager wants the wide men to contribute going forward and back the way. That’s what I have tried to do. “I think definitely I have improved defensively since I came here, and tactically. Mackay-Steven knows he has to maintain his standards given the plethora of attacking midfield options available to Deila. Patrick Roberts, Scott Allan and Ryan Christie came on during last weekend’s 3-0 win over Inverness and all three combined to set up Leigh Griffiths to net the final goal. Mackay-Steven, who hit the opener, said: “It’s quite tough when you are out the team to get back in it when the team is winning. “We’ve got a lot of strength in depth in most positions, especially midfield. The manager has a headache every week because most of the boys are fit and performing well in training. It’s great competition. “Training is quite competitive at times, there are a few meaty challenges here and there. But it’s all in good faith, we all get on with each other. The more competition the better. “It’s something you know when you come to a club like this, the standard of player is so high in every position, so you know it’s going to be tough. “The manager is open with everyone that they will get a chance if they do well in training, and just to be ready when they get the nod. Mackay-Steven made his first league start for three months in the 8-1 win over Hamilton on January 23 and has gone from strength to strength since. But Accies have also improved and Mackay-Steven expects a much more difficult game when they face the Lanarkshire side at New Douglas Park on Friday night. “Since that defeat they have gone on a pretty decent run,” he said.